With so many cats and dogs left to starve–even those owned by the wealthy and well-to-do–it is no wonder that American electrician and entrepreneur, James Spratt, saw an opportunity when he visited England in the 1860s. Though a few writers stressed the need for separate food for domestic cats and dogs prior to this period, and some English companies did sell dog biscuits, Spratt was the first to take a patent on dog food and turn it into a necessity for pet owners. He entered the market in the 1870s with his patented dog biscuit, “Patented Meat Fibrine Dog Cake,” consisting of blended wheat meals, vegetables, beetroot and buffalo meat, was manufactured on the premises of London-based firm, Walker, Harrison and Garthwaite, who claimed to have baked the first dog cake. Spratt actively courted the business of English sporting gentlemen, who were convinced of the need to care for and feed their dogs as well as they did their horses. With his successful maneuvering to the forefront of the dog food market, Spratt began manufacturing cat food, where testimonials proclaimed “Of the solid foods sold…the least generally said the better…some of it is simply rubbish, the chief efforts of the vendors being the extraction of cash…The only exception is Spratt’s Cat Food.” Spratt began to sell his products in the United States, also targeting sportsmen, kennel clubs, and dog shows, and after his death in 1880, the company set up an American branch first in New York City, and then in Newark, New Jersey, where it continued to file patents for improved business. Pushing the company further into the public eye as the only destination for healthy, tasty and nutritious pet food, the company went public and became known as Spratt’s Patent, Limited, and Spratt’s Patent (America) Limited. 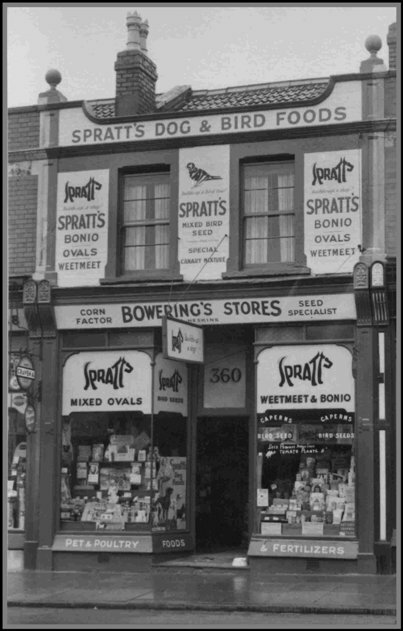 Spratt’s marketing was aggressive, with product recognition developed through a logo, billboards, ads in magazines, and cigarette cards, as well as the novel concept of pets requiring different food for each of their life’s stages. By the 1890s, Spratt’s was able to boast of a “Special Appointment” to Queen Victoria, as well as a loyal aristocratic clientele on both sides of the Atlantic. In England, Spratt’s expanded its offerings to become a one-stop shop for anything pet owners needed, from supplies and appliances, to boarding, quarantine, and shipping services, show and exhibition services, and informational brochures and magazines. 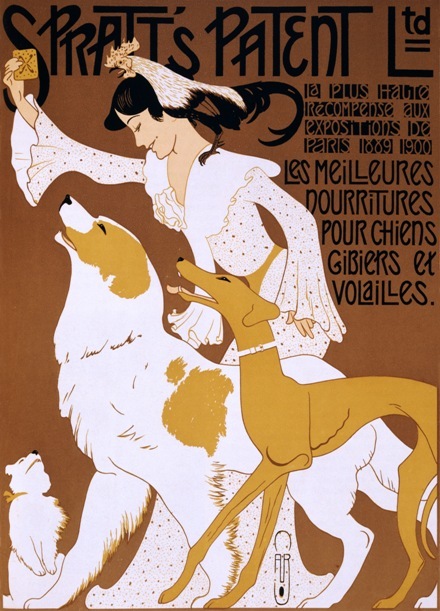 The company further made its mark at the 1904 World’s Fair in St. Louis, where its display was tiled entirely in dog biscuits. By the turn of the century, Spratt’s was synonymous with top-notch cat and dog food, but competition soon nipped at its heels. The manufacture of pet foods had become so widespread–which naturally lowered prices–owners were shockingly advised to feed their pets three to four times a week! The biggest competition Spratt’s faced was the emergence of F. H. Bennett’s “milk bone biscuit.” Though Bennett’s other pet food failed to find an audience, his fortune was made with the milk bone biscuits, and soon, other manufacturers stepped up, such as P. M. Chappel with his canned dog food “Ken-L-Ration,” in the 1920s, and Clarence Gaines with his dry formula. Spratt’s and its competitors held on until the post-WWII period, when consumers began to educate themselves on proper nutrition and health for their beloved pets. Most pre-war companies were swallowed by national conglomerates, or faded away into obscurity, but had it not been for such companies as Spratt’s, I am sure hungry cats and dogs would have probably turned on humans a long time ago! It seems as if Spratt was very smart in actively courting the business of English sporting gentlemen, who were already convinced of the need to care for their working dogs. And in going to dog shows, kennel clubs etc. But the big surprise was having a display area of his own at the 1904 World’s Fair in St. Louis. Million of visitors, interested in the newest objects and inventions to emerge throughout the Edwardian world, must have loved it. Me too. I think World Fairs were super. I can’t imagine a world without pet food, lol. But yes, Spratt was very shrewd in his marketing, and I too find the World’s Fairs really amazing. What breeds of dogs, cats, and horses did they have? How popular was each breed?